Rebecca Taylor and Gayle Keresey presented their program on the Federal Point Lighthouse. Originally built in 1816, the first Federal Point Lighthouse stood guard over “New Inlet” for almost 80 years. 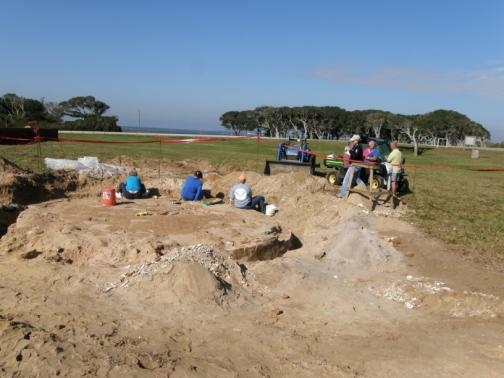 The foundation recently found on Battle Acre at Fort Fisher matches the description of the second light built in 1837. That light was dismantled by Colonel Lamb and his soldiers during the Civil War to deprive the Union blockaders from such a handy target. The third light, which was a two story house with a light on top, was built in 1866 and served until “the Rocks” were competed ,and New Inlet was closed. It burned in the early 1880’s and remnants of it have not been discovered tough they are thought to be somewhere on the Aquarium’s property.